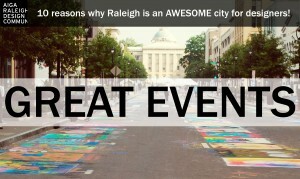 Great Events- There are a ton of creative events for designers in the area! There’s SPARKcon, which is a full four days of creative explosion that includes design, art, music, film, fashion, geek, circus, dance, comedy, etc. There’s Artsplosure, which brings cultural experiences through events that inspire and entertain, inform and celebrate, create and share. 2014 was the first year for the Hopscotch Design Festival, which gathered distinguished national talent and notable local contributors to share ideas and foster conversation about how design is shaping the future. The idea for this was based upon Raleigh’s popular and successful Hopscotch Music Festival which celebrates music. These are just a very few of the big design inspiring events you’ll see around the area and this doesn’t even include the design events that AIGA puts on!